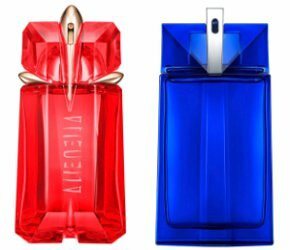 Thierry Mugler has launched Alien Fusion, a new flanker to 2005's Alien fragrance, and Alien Man Fusion, a new flanker to 2018's Alien Man. Alien Fusion ~ "Introducing Alien Fusion for 2019, continuing the quest in search of a new dawn and light. Alien Eau de Parfum Fusion is a powerful sensual fragrance. Inspired by a solar eclipse, this fascinating spicy floral oriental fragrance combines a flamboyant hot scent with an intriguing sensuality." With ginger, cinnamon, tuberose, orange blossom, vanilla and white amber. In 30 and 60 ml. Alien Man Fusion ~ "Introducing Alien Fusion for 2019, continuing the quest in search of a new dawn and light. Alien Man Fusion is a woody, leathery and spicy Eau de Toilette, a seriously seductive and elegant fragrance for men." With ginger, cinnamon, osmanthus, leather, green coffee and smoked beach. * In 50 and 100 ml. Mugler Alien Fusion and Alien Man Fusion are limited editions. They can be found now at Boots in the UK. * I am guessing they mean smoked beech? Interesting, wonder if I will see it here? I know the women’s is coming to the US (I think next month), but not 100% sure about the men’s. Too bad. Love the blue bottle. And I’d be interested to smell how much leather it has in it. And the smoked “beach”. I think Alien Man just now launched at Macy’s?? Maybe I’m wrong. But if so might mean this will just be delayed. I’m not sure I’m interested in the fragrance but I kind of like the red bottle…. Definitely thinking of making a blind buy! 1) Spicy Floral Oriental? Why hello, nice to meet you, Alien Fusion! 2) I hope they mean Smoked Beach, though, because that is a scent that is here on the Oregon Coast almost every weekend- fires on the beach, scent of smoke and marine air.